ATLANTA -- A tornado touched down near Atlanta Wednesday as heavy storms continued to sweep through parts of the South. The National Weather Service confirmed the tornado was located about seven miles north of Atlanta moving northeast about 40 mph around 1:50 p.m. Wednesday. A tornado warning was issued for counties including Fulton and DeKalb. NWS meteoroligst Keith Stellman said there was some damage west of Atlanta near Six Flags Over Georgia. The weather service reported down power lines and multiple trees along with some roof damage. A tornado watch was issued to more than 50 counties including Cobb and Gwinnett. It should expire at 6 p.m. Wednesday. Apparent tornadoes that dropped out of the night sky killed five people in Alabama and Tennessee and injured at least a dozen more early Wednesday, adding to a seemingly biblical onslaught of drought, flood and fire plaguing the South. The storms tore through just as firefighters began to get control of wildfires that killed four and wiped out more than 150 homes and businesses around the resort town of Gatlinburg, Tennessee. In Alabama, the weather system dumped more than 2 inches of rain in areas that had been parched by months of choking drought. High winds damaged homes, splintered barns and toppled trees in parts of Mississippi, Tennessee and Alabama. Tombstones were even knocked over in the cemetery behind the badly damaged Rosalie Baptist Church, near where three people died in northeastern Alabama. “It looks like the rapture happened up there,” said church member Steve Hall, referring to the end-times belief of many Christians. “Are we thinking the Lord is trying to get our attention?” said the pastor, Roger Little. The weather service was assessing damage from multiple possible tornadoes across the region. 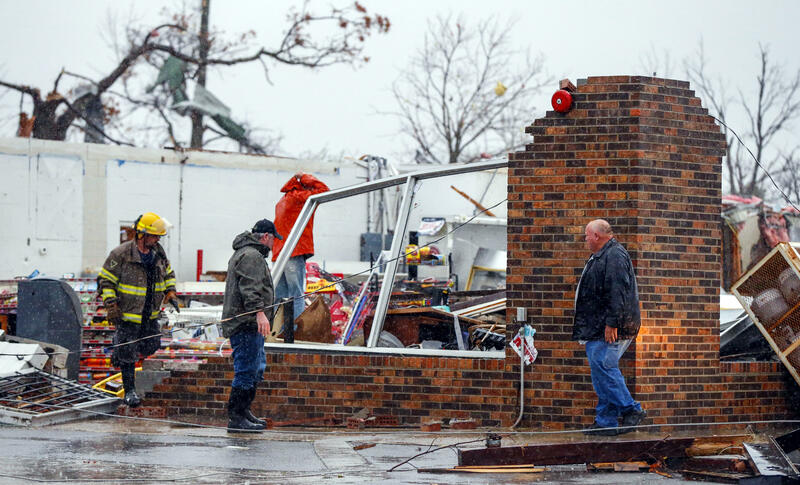 Three people were killed and one person was critically injured in a mobile home after an apparent twister hit tiny Rosalie, about 115 miles northeast of Birmingham, said Jackson County Chief Deputy Rocky Harnen. A suspected tornado was responsible for the death of a husband and wife in southern Tennessee’s Polk County, while an unknown number of others were injured, said Tennessee Emergency Management Agency spokesman Dean Flener. No details were immediately available. Shirley Knight, whose family owns a small propane business in Rosalie, said the storm crashed in on them in the middle of the night. Daybreak revealed mangled sheets of metal, insulation and a ladder hanging in trees. “We had a plaza, a service station and several buildings connected together, and it’s all gone,” said Knight, adding that the storm also destroyed a church and damaged buildings at a nearby Christmas tree farm. The same storm apparently hit a closed day care center in the community of Ider, injuring seven people, including three children who had left their mobile home to seek shelter, said Anthony Clifton, DeKalb County emergency management director. Alabama Gov. Robert Bentley issued a state of emergency because of the storms. Meanwhile, thousands of people were without power, including up to 45,000 homes at one point in Alabama. Many schools dismissed early in Alabama and Georgia to avoid having students on the road in buses as storms continued to roll across the region Wednesday. Teams from the National Weather Service confirmed that at least two weak tornadoes struck western Alabama, and meteorologist Kurt Weber from Huntsville said they were assessing damage tracks from at least four other possible tornadoes. Tornadoes and hail also were reported Tuesday in Louisiana and Mississippi. The National Weather Service in Jackson, Mississippi, counted six confirmed tornadoes in areas of the state it monitors. Despite dozens of tornado warnings, authorities said no one was injured in Mississippi, but six homes were reported destroyed in one southeastern county. Mississippi Public Service Commissioner Brandon Presley said he came upon a UPS truck that was blown onto its side and hit a pickup truck. “I’ve never driven through something like this in my life,” Presley said. Torrential rains filled waterways and ponds that were drying up just days ago. Police in the northwest Alabama city of Florence put out barriers to block roads that flooded with as much as 2 feet of water when fallen leaves clogged drainage systems during torrential downpours. Streams were cresting in western Alabama after as much as 4 inches of rain. All that water will only help snuff out wildfires that have burned thousands of acres across the region in recent weeks. Tod Hyslop, a National Weather Service meteorologist in Morristown, Tennessee, said the Gatlinburg area had received as much as an inch of rain overnight by early Wednesday, and precipitation was still falling. Tennessee Emergency Management Agency spokesman Dean Flener said any rain will help, but the fires were still an “ongoing situation.” The rains were also helping douse wildfires in the Carolinas, officials said.